As we all know, a solar panel must be exposed to the most amount of sunlight possible to reach full efficiency. A solid mount limits the amount of time that the panel is fully exposed to direct sunlight. The solution is to build a pivoting mount that automates the process of aiming at the sun. [bwitmer] takes us through the process of building one out of some wood and old bicycle rims. He bought a pre made tracking unit to control his actuator, but we think many of you here could rig something up on your own. hm, I’d like to know what efficiency gains are achieved by this. After all, the motor does take power to run… Is the angle that important at generating the most power? “A solid mount limits…” – so we should be using FLIMSY mounts instead? Moving the panel closer to its rotational axis would decrease the amount of power one would need for tracking (i.e., you’d get better efficiency). you sure about this? i expect that a variant on the stepper where only a single coil is energised at a time (and then only long enough to step the panel a cm or so) wouldn’t use much power. for the sort of movements needed two or more CDROM loading drawers would probably do the trick, after all it only needs to tilt +/- 45 degrees. The ratio of energy collected, E1/E2 is pi/2, approximately 57.1% more energy collected by the tracking panel before losses to powering the tracking. This is independent of panel size, amount of sun, length of day, efficiency etc. If the panel is mounted so the axis of rotation is coincident with a north-south line and passes through the mass center of the panel, and the panel is mounted on good bearings, the required torque to move the panel should be relatively small. for the required work to rotate the assembly for the whole day. This assumes that the mass of the assembly will be proportional to its area, the required axle diameter is proportional to the length of one side of the panel, the panel is square, a surface are density for the panel of 90kg/sq m, and a aspect ratio of 0.02 for the axle diameter to side length. Say we rotate our panel in 100 increments throughout the whole day (180 degree rotation) and wish to only pulse our motor for 5 seconds to achieve the desired rotation increment, after which we brake. We’ll use crappy bearings with u=0.004, and a panel 1m on a side. W = 300 J, an average power consumption for 10 hours of 0.008 watts. Assuming lets say 10 hours of sun at STC and a 12% eff panel the tracking one will produce 43.6 more watts of energy, more than paying off the 0.008 consumed by tracking. Answering a quick “I wonder…” question with actual physics: Priceless. The required energy to rotate a panel intelligently is miniscule in comparison to the energy gains. totally in agreement w/ u. a small motor would never take up all the juice of that size cell. Steppers are the worst type of motor to use because they must be fully energized at all times to hold their position. Gear-head motors are the best, particularly a worm-drive type because they can be positioned and held in place with very little or no energy. And some can be had with mechanical brakes that automatically disengage when the motor is energized. 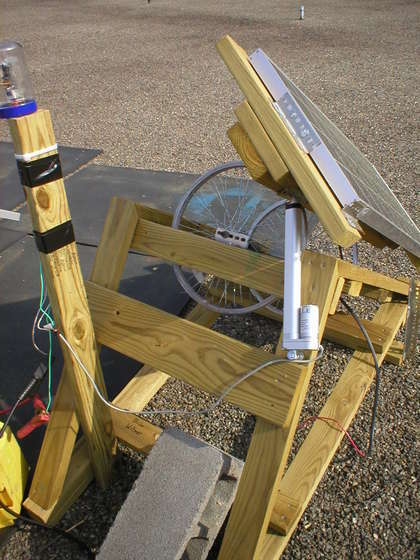 About 20 years ago I saw a freon based solar tracker. It did not use any electricity to run. Clever, and the only moving part was the two pivot points for the solar panel. The freon based one was featured in Mother Earth News. They had 2 models, one that used freon filled tanks that caused the panel to pivot based on a weight equilibrium, the second used the same freon tanks and a double acting hydrolic cylinder. the freon would build pressure in the tank directly facing the sun until enough pressure was created to move the cylinder, that would change the orientation of the panel until both tanks equally faced the sun, that would even out the pressure on both sides of the cylinder causing the unit to stop. According to the author, the second model tracked the sun perfectly and was held steady in place even during windy times. The first model was particularly vulnerable to wind and cloud shade. Power drain is not an issue here unless it is enough to drastically discharge an entire battery bank. Solar panels are used to charge batteries which in turn power whatever they are supposed to power. A momentary small increase in power to run a small motor for a very short length of time won’t amount to anything in the great scheme of things. Especially since the panel will spend a lot more time facing the sun dead-on than the time the small motor will spend running. A thought, however… this could include vertical movement as well as horizontal for even greater efficiency with two motors in a gimble apparatus and added up-down sensors with the panel on two axes, one side-to-side and one top-to-bottom.